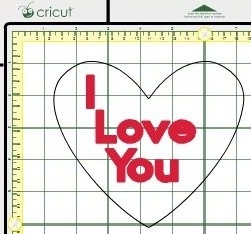 First you have to have your Imagine and a copy of Cricut Craft Room (CCR). The CCR build has to be 132 for the Imagine to be able to cut. (Another problem PC needs to fix.) If you don't have the old build 132, here is how. If you don't want to use the old version of CCR this is possible using the Gypsy, but incredibly difficult. The Gypsy cuts with the mat rotated 90 degrees on the Imagine. Very simple example. We want custom letters inside a shape. Print the letters, cut the shape out. Great for making tags for gifts. Now when you build your project, keep the shapes you want to cut on a different layer than those you want to print. Pretty simple sample here. The heart shaped card will be cut, the letters will not be. So I named the first layer 'Heart' by clicking on the pencil and typing in 'Heart'. If the project is huge and complex, perhaps naming the layers 'Print' and 'Cut' would be easier. The click 'Add New Layer' and make your 'Letters' layer. Click on the 'Heart' layer to make it active. Add the heart like normal, just drag it up from your Images/Overlays to your mat. Select the 'Letters' layer and add the text boxes for the letters just like normal using the 'Font' area. Fill the letters with color. So now you should have a heart on one layer and letters on the other. Click the 'Go' button to open the print and cut menu. Here you see the print options for your layers. Under 'Cricut Mode' , select 'Print'. Your Imagine will prompt you to load the mat just like normal. On the same 'Print & Cut' screen, select the other layer for cutting and change the mode to 'Cut'. Hit 'Go!' and follow the on-screen instructions to load the mat. This time it skips the print phase and goes straight to cut. Print custom text inside a shape and cut it out. This is a pretty simple work around that allows you to use any font you have to print any text you want inside of a a design. Using the 'Shape Properties' fill function, you can easily create 30-40 tags on one sheet and mass produce them for a baby shower or wedding.